I’d been waiting for a moment like this since blowing my budget on the winning bid at a charity auction a few years ago. You know how those go. You see some luxury item you like on the silent auction table at one of the many charity events this time of year. You want to help a good cause, but the next thing you know you’re in a pitiless bidding war with the other black ties and ball gowns over a puck signed by the Panthers, or a football signed by the Dolphins or a bronze monolith signed by Botero. (Got some explaining to do with the neighbors). Anyway, I found myself that winter of 2014 locked in a merciless bidding war with my fellow guests for a bottle of Gevrey-Chambertin, 1987; and a bottle of Nuits-Saint-Georges, 1990. (I know, I know – the things I do to help a good cause). Googling on my phone as fast as a man in dim lighting and formal wear can, I read Robert Parker’s authoritative Wine Advocate had declared the Nuits-Saint-Georges among “the best wines yet produced.” Wine Spectator piled on, describing a taste of “rich earth, truffle and fruit aromas.” I increased my bid. Googling on, I couldn’t find anything about the Gevrey-Chambertin – but, all signs pointed to a miraculous wine here, at a relatively miniscule price. 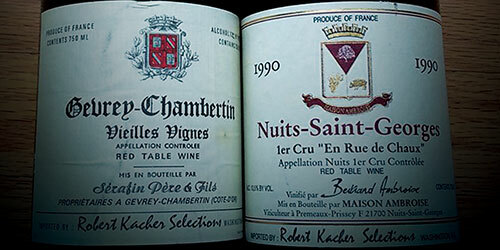 And, after all, it was three (3) whole vintage years older than the Nuits-Saint-Georges. Long story short, I won the bid, left the party with two bottles of vintage French wine tucked under my formal wear – and, no doubt, the beneficiary of the auction – a museum – went on to buy a new animatronics wing. At home, I put my two bottles into the “cellar’’– which true oenophiles would correctly identify immediately as a “mini fridge” – and waited for just the right moment to open and pour the wines. And waited. The day my son graduated from college? No – I have two sons, and the younger one hadn’t graduated yet. Better not drink now for one, and jinx it for the other. The day I got my new car? No, because I wanted to drive my new car without fear of a rich earth, truffle and fruit aroma breathalyzer test. The day the new season of House of Cards showed up on Netflix? Tempting, but, no, better save it for Better Call Saul. On and on my potential moments came and went. Until, finally, my in-laws – from France! – were coming to stay with us for the holidays. What better moment to open up one of these old, miraculous French wines than in their company! So, we’re at a nice restaurant when – quelle surprise! – I pull out the Gevrey-Chambertin I’d tucked into my jacket. A special wine, for a special moment. Nods of approval. What a special son-in-law! Well, I blush, nothing’s too special for a special moment like this. The sommelier arrives and – with the kind of show you’d expect from someone who knows the difference between a cellar and a mini fridge – opens and decants the ruby liquid from the bottle. Then, after a reverential moment to let the wine breathe, he pours it into our stemware, we murmur our santés and raise the Gevrey-Chambertin to our lips. Much later, I asked Shari Gherman, president of South Florida’s American Fine Wine Invitational competition, how long you should keep a wine before drinking it. I’d been waiting for a moment, 18 to 21 years ago. I hope you’ll consider this sad, cautionary tale as you look over our Luxury Issue. Because the greatest luxury in life, sometimes, is knowing when – and when not – to wait.